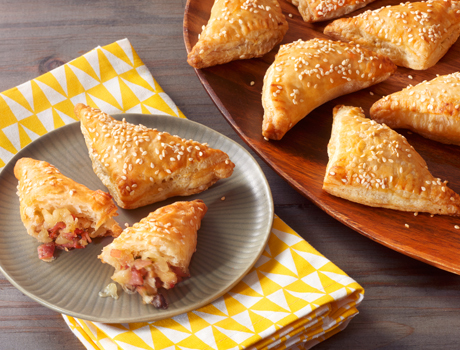 Prepared puff pastry dough makes it easy to prepare these scrumptious ham and cheese pastry pockets that are sure to be the hit of your next party. Heat the butter in a 10-inch skillet over medium heat. Add the ham, mushrooms and green onions and cook until the vegetables are tender. Stir in 2 teaspoons flour, the oregano and pepper and cook for 1 minute. Remove the skillet from the heat and stir in the cheese. Sprinkle the work surface with the remaining flour. Unfold 1 pastry sheet on the floured surface. Roll the pastry into a 9 x12-inch rectangle. Cut the rectangle into 12 (3-inch) squares. Repeat with the remaining pastry sheet, making 24 squares in all. Spoon about 1 tablespoon ham mixture in the center of each square. Brush the edges of the pastry with the egg. 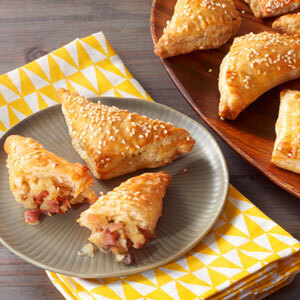 Fold the pastry over the filling to form a triangle and crimp the edges with a fork to seal. Place the pastries on the baking sheets. Brush the pastries with the egg and sprinkle with the sesame seeds. Bake for 15 minutes or until the pastries are golden brown.